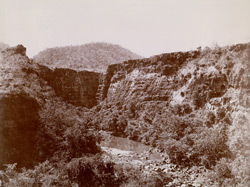 Photograph of the valley of the Ajanta caves taken by Deen Dayal in the 1900s. The Buddhist cave temples of Ajanta were excavated into a horse-shoe shaped cliff overlooking the Waghora River in the 2nd – 1st century BC and later in the 5th century AD, a period of time which coincides with the Hinayana and Mahayana phases of Buddhist art. The caves consists of monasteries(viharas) and prayer-halls (chaityas) and were used by the community of Buddhist monks who resided there. The later caves are very rich in sculptures and paintings which are unparalleled in the history of Indian art.